The early Christian Bible scholar, Origen of Alexandria (ca. 182 – ca. 251) cited passages from the epistle to the Hebrews quite a number of times in his own writings saying it was Paul’s epistle, but he had to concede that, as quoted later by Eusebius of Caesarea (263-339), “Who it was that really wrote the epistle, to be sure, only God knows.” As early as the second century, some manuscripts of this epistle bore the title “To the Hebrews” and were attached to the collection of epistles by Paul. No other tradition has come down from early Christian writers to doubt Paul’s authorship. Misgivings only arose from about the third century onwards and are prevalent today among some so-called Bible scholars. One of the reasons why some people think that Paul did not write Hebrews is the linguistic style employed. To address this subject properly one would need a thorough grounding in New Testament Greek. 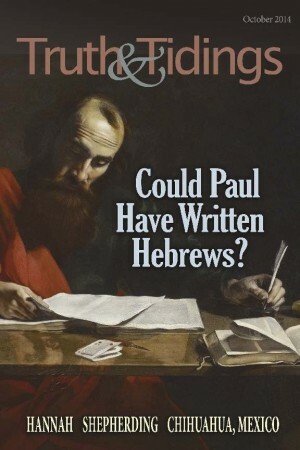 However, even the average Bible reader with no profound knowledge of the original language can profitably ask the question, “Could the apostle Paul have written the epistle?” rather than “Did he?” In attempting to do this, serious consideration needs to be given to Peter’s statement about a well-known epistle of Paul’s, written to some Jewish believers. To whom did Peter address his remarks in his second epistle? William Kelly wrote “Peter in his second epistle, addressed … the elect Jews of the dispersion” (cf. 1Peter1:1-2 and 2Peter 3:1).They lived throughout Pontus, Galatia, Cappadocia, Asia, and Bithynia, Roman provinces in Asia Minor, which is more or less coincident with modern day Turkey. Six times in Hebrews we read about salvation, and those particular mentions that are pertinent to our question are: 2:3; 5:9 and 9:28. In the first reference the Lord Jesus was the One Who first began to speak about “so great salvation.” It was this longsuffering Lord Who was still waiting for the “neglecters,” who, after so long a time, had not yet been saved, and for whom there was no other means of escape. In the second reference, it is not “so great salvation” but “eternal salvation.” Through His death on the cross “He became the author of eternal salvation unto all them that obey Him.” Third, those who obey Him are those who “look for Him,” and for them He shall appear “the second time without sin unto salvation,” so that they will then experience the full blessing of salvation.